There are two ways to enter the grading area of AT&S. Click on the little Fellow or red pen icon to the left of an assessment title. It will take you directly into Grade Submissions for that item. The little person icon indicates that students have begun the assessment but there is nothing for you to grade at this time. If there is a red pen icon, it means that you have student submissions that are ungraded. Click on the Grading link at the menu bar. It will take you to a list of published assessments that you can grade. When you click on the Grading link at the top of the page, you’ll see a list of all published assessments, both those with and without submissions. 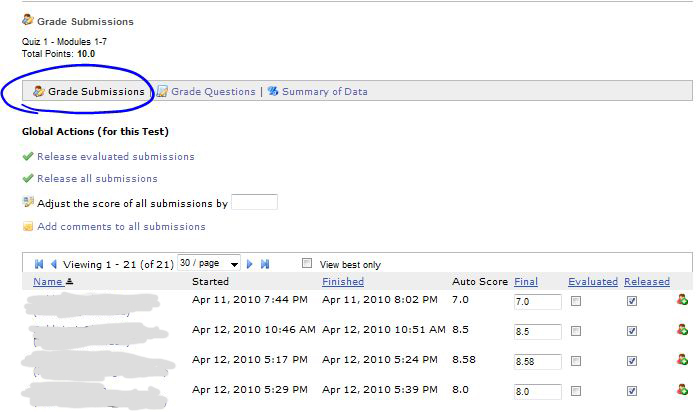 If there are essay questions that need to be manually graded, you will see a small “needs grading” icon to the right of the status column, indicating that you need to grade the submission. The “needs grading” indicator will disappear once all the ungraded submissions have been graded. It will show up again if new submissions that need to be graded are received. Objective exams never get the Ungraded icon, even if you set them to Manual release. They are always auto-scored. A unique use case where the Ungraded flag is displayed in objective exams is when you set them to ‘manual release’ and ask students to include ‘reason for answer’. Review the reasons for answer, adjust the score, as needed, or add comments to students, and release the submissions. To learn more about the usages for the “needs grading” indicator, please see Grading Indicators in AT&S. To grade submissions, click on the live submissions icon to the left of an assessment on the list of Assessments or on the title of an assessment on the Grading page. You will be taken to the Grade Submissions page for the assessment. It will look like the example below, with the title of the test and total points possible up at the top. The students are listed below the global options for the assessment. The names of students who have submitted their assessments will be hot links. Those with no submissions yet will be listed in plain black text. Status can be: Not Started, In Progress, Submitted, Evaluated, or Released. You can sort the submissions by status. The default grading page is Grade Submissions, which allows you to view all of one student’s answers at a time. If all questions on the assessment are objective, they are scored automatically by the system. To see a student’s submission, click on the title of the assessment to go to Grade Submissions. If there are essay questions on the test, you’ll have to score those yourself. The Grade Submission page lists all students. If you have a very large class, you can limit each page to show 50, 100 or all students on one page. Remember that if you list many students per page, it could take a few seconds longer for that page to load. If students have submitted multiple tries, all of their submissions will be listed by default. Multiple submissions by a specific student will be displayed one after another in the list of submissions, in alpha order and submission date. If instructors want to see just the best effort for each student (the one with the highest score that counts and was sent to the gradebook), they can check the “View best only” option at the action bar. By default, all submissions (even multiple tries) are listed. When clicking on a student’s submission, if he had submitted several, clicking on Next will take you to their next submission. You can identify the submissions by their unique started and finished dates. If you have mixed essay questions with objective questions on an exam and you allowed multiple tries, a student may have done better on the objective questions on one try, and better on the essay answers on another try. You may want to review and evaluate all the attempts / submissions per students to see the best essay responses. It is probably not a good idea (labor-intensive for graders) to allow multiple tries in assessments that include essay questions. If you have many sections in one Etudes site, you can grade submissions by section. This applies to all assessment types. You can use the Section filter (see yellow below), and select the section that you want to grade. As you navigate from page to page, only the selected section’s students will be listed. When you’re grading assessments, there is a Next link at the top of each exam, that allows you to jump from Student 1 to Student 2 to Student 3, etc. If a student has submitted multiple attempts and you have checked “view best only,’ the Next link does NOT go through all submissions for a student. It takes you to the next student’s submission, bypassing any additional submissions of the student you are evaluating. Only the best submission per student, which is counted toward grading, is included in the navigation structure. If you’d like to see other tries for a student, uncheck “view best only” on the grade submissions page. You may also notice some other user interface differences in the grading views to enhance efficiency in grading. For example, assessment instructions are collapsed in all grading questions as sometimes, assignments can be pretty lengthy and add to unnecessary scrolling when grading. Likewise, model answer and hints are collapsed, as well. Any of these components can be expanded with a click on their heading which is a hot link. They’ll expand inline.